Josh and Tiffany Noel, of Morton, were married in 2005. After six years of marriage, the couple realized starting a family wasn’t happening naturally and began having concerns about their fertility. What they thought would be a joyful journey to parenthood, turned out to be a roller coaster ride of uncertainty that would ultimately bring them their greatest gift. In 2012, Tiffany and Josh were referred to a fertility specialist. 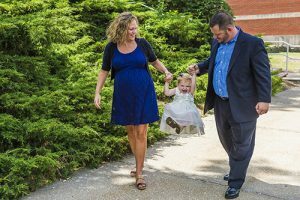 Tiffany underwent several rounds of fertility treatments. To the couple’s disappointment, the treatments were unsuccessful. “The treatments were very taxing and invasive,” Tiffany said. Tiffany’s gynecologist performed a laparoscopic surgery to determine if there were underlying causes in Tiffany’s reproductive system. The doctor discovered she had stage four endometriosis and adenomyosis. Endometriosis is a condition where the tissue that normally lines the inside of the uterus grows elsewhere, like the ovaries. Adenomyosis is a condition where the endometrial cells grow into the uterine walls. Tiffany’s doctor told her their only option to conceive was through a fertility treatment that would cost $20,000 out of pocket. “We surrendered to the fact that we wouldn’t be biological parents,” Tiffany said. That was until Tiffany’s co-worker gave her a life-changing recommendation to see Dr. Jillian Stalling, an obstetrician/gynecologist at OSF Women’s Health & Advanced Fertility in Peoria. The practice focuses on monitoring and treating gynecological and reproductive health naturally through the Creighton Model FertilityCare System and Natural Procreative Technology. On July 29, 2014, Tiffany underwent a nine-hour surgery performed by Dr. Stalling, who was able to laparoscopically remove most of the endometriosis and adenomyosis. “A few months after surgery, I didn’t have heavy menstrual cycles or severe cramping anymore,” Tiffany said. Tiffany also started charting her cycles to help uncover abnormalities related to her gynecological health. Her chart showed she was low in progesterone – a hormone that plays a role in maintaining pregnancy. In March 2015, Tiffany realized the unthinkable – she was a week late for her cycle. She called Dr. Stalling’s office immediately, and they had her come in for blood work. On November 23, 2015, the couple welcomed their baby girl, Lily. Today, Lily is a healthy toddler, who will be promoted to big sister this fall.